Oxfam with the support of the European Union has distributed dry season farming inputs to farmers in Kebbi State in its bid to improve livelihoods of small holder farmers. The distribution, which took place onWednesday, at Birni Kebbi was part of Pro Resilience Action (PROACT) Project, anEuropean Union Support to Food Security and Resilience in Northern Nigeria. Six thousand bags of fertilizers were distributed to 1,500 farmers as 400 surface irrigation water pumps were also handed over to over 62 farmers groups for the 2017 dryseason farming activities. According to a statement issued by Oxfam after the event, fertilizers and irrigation water pumps are critical to dry season farming production in Kebbi State and most small holder farmers have been having challenges accessing these inputs. During the ceremony, the Commissioner for Agriculture and Natural Resources, Alhaji Mohammed Dandiga, implored the beneficiaries to make good use of the inputs for theintended purposes only so as to improve theirproductivities. “You are not theonly dry season farmers in the State but you are privileged to be among theselected farmers to benefit from this gesture. That is why it is very importantfor you to keep to all the rules and ensure you fulfil your own side of the commitment so that other farmers will benefit as well. We have to express our gratitude to Oxfam for selecting Kebbi State for the Project,” said Dandiga. 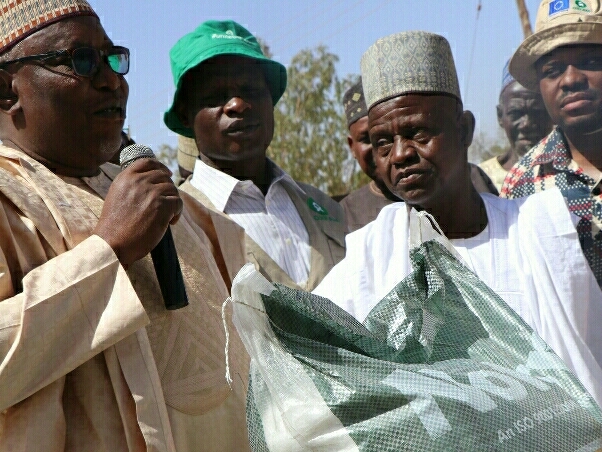 According to the Programme Manager, Kebbi State Agriculture and Rural Development Authority (KARDA), Mallam Sanusi Illo, the distribution of the inputs to the farmers was timely and strategic, adding that small holder farmers have been sitting on abundance resources but lack institutional supports, new knowledge and skills to explore the potentials around them. Corroborating that, Oxfam Livelihood and Private Sector Manager, William Mafwalal, said the projectis supporting the state government in its efforts towards improving agricultural productivity, enhancing food security and reducing poverty, especially among small holder farmers in rural communities. “This is just the beginning of the full implementationof the project. It is a four-year intervention with lots of components allaimed at fighting hunger and building the resilience of farmers,” noted Mafwalal. Dandiga; Livelihood and Private Sector, Oxfam, William Mafwalal;Permanent Secretary, Ministry of Agriculture,Mohammed Lawal-Argungu and the Coordinator, Oxfam/EU Pro Resilience Action Project (PROACT), Olumide Ojo,during the distribution of Oxfam/EU PROACT fertilizers to dry season farmers in Birnin- Kebbi, on Wednesday.